That faraway gaze sprinkled with a sparkle of rekindled joy in his eyes was becoming more familiar these days as he reflected and reminisced of past memories – memories of a simpler time when laughter, friendship, and comradery was never in short supply, especially when in the presence of those whom did life together – a family in a sense. 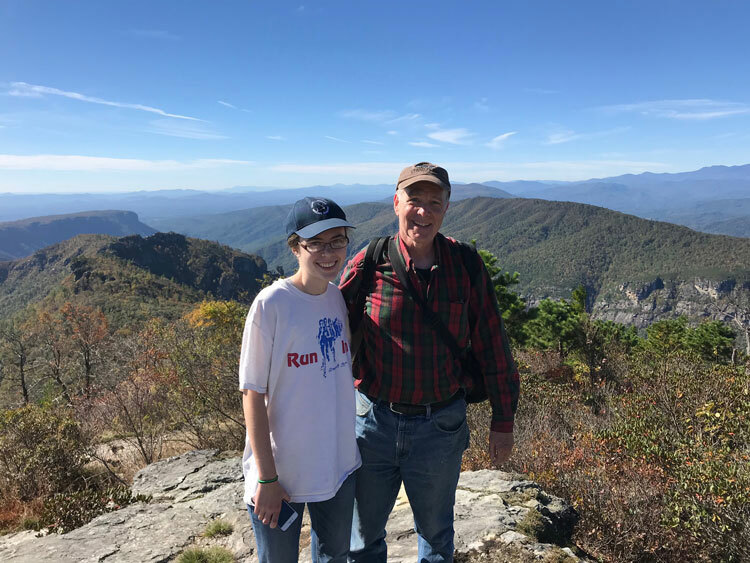 That family consisted of Dad and his close friends whom he would take to his favorite camping spot – Linville Gorge. Life is a challenge and journey of its own, and sometimes a brief respite for the soul is the best medicine to assuage the burdens and cares of life and breathe in the fullness and vitality inherent in nature. 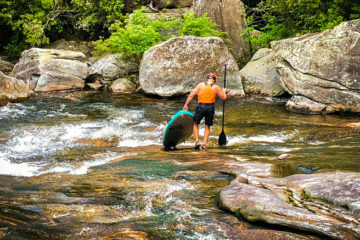 Linville Gorge was a place of special memories that spanned over three decades, and now those memories were beginning to resurface in Dad’s own mind as he recognized the familiar gentle nudge to return to where those memories were born. As he gazed at old pictures of him and his friends perched on a large slab of granite rock or sitting in a circle huddled around a toasty fire bundled in hoodies and smudged hiking boots, the fond sentimental memories returned, evoking the sense of nostalgia that was heightened by tangible reminders of old photographs, capturing the timeless sense of carefree spirits spent with lifelong friends. Nature has a peculiar way of realigning our priorities, allowing us to appreciate the small moments made special by the company of those dearest to us and gently reminding us to slow down and instead relish the present moment. What better way to reflect on my own life and unknown future as a soon-to-be college graduate than in a safe haven like Linville Gorge – a rugged refuge where one could silently marvel at the beauty of the stark landscape carved with the rolling Blue Ridge Mountains punctuating the outline of the horizon, silent spectators of the roaring Linville River winding its serpentine path through the canyon over a thousand feet below. Here was an oasis where I could lazily watch the sun slip past the mountains at dusk as brilliant rays of sunshine mixed with golden clouds created an ethereal masterpiece of unmatched beauty. Yes – I think I could contemplate life and all its mysteries here. The mountains were calling and I must go. I would only be made better all the more by doing so. The fall leaves of October were barely visible in the leaves of the hardwoods. Only a faint hue of golden brown and burnt auburn hinted at autumn’s arrival. I’m sure you’ve heard the saying that the journey is the destination, and I believe this succinctly described our trip down the dusty off-beaten road riddled with potholes headed for our destination. Ginger Cake was certainly what seemed like an off-beaten road that weaved its way across rocky terrain towards the Table Rock picnic area on the east side of Linville Gorge. We carefully inched our way around bright orange road hazard signs placed beside freshly fallen trees and rocky eroded areas alarmingly close to the outer edge of the steep drop off that descended into a dense forest of trees. Every pothole sent our SUV into a series of unsettling jolts as we swayed back and forth, carefully maneuvering our way around the sharp curves while we breathed in crisp mountain air wisping through rolled down windows. Our camping equipment consisted of a large 4-person tent, a cot, sleeping bags, a folding cooking table, tarps, 2 backpacks, water bottles, a cooler, a stove, a lantern, hand warmers, and LED lights among extra emergency provisions. To say we brought too much would be an understatement. Half of our supplies were never used and instead remained in the car, but Dad, who is always prepared for the worst and knows the ins and outs of outdoor survival, assured me that we were prepared, and I had no reason not to believe otherwise. I will spare detailing our ascent to our campsite which was approximately a quarter of a mile from the parking lot. 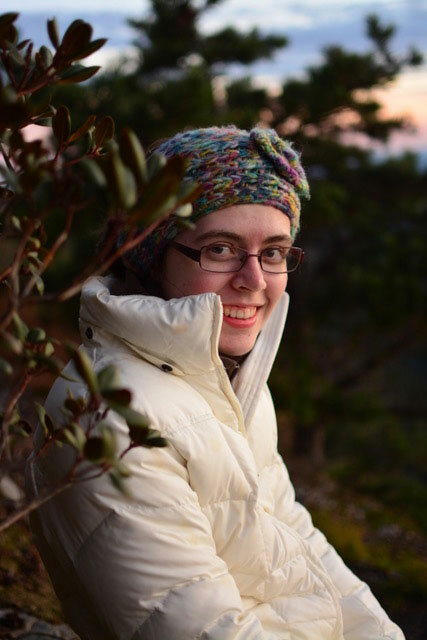 However, I don’t deny that we were the subject of humorous conversation as hikers curiously glanced at our bulging backpacks and perspiring brows, knowing full well what we were reluctant to admit: we had simply brought too much stuff. After multiple trips to and from our car and campsite with the last trip seemingly longer than the first, we were finally settled. What was once a secluded nook tucked secretly away in a nest of pine trees was now a semi-exposed area surrounded by hardwoods. To our left rose the bald outcropping of Table Rock towering above the mountains, the distant echo of hikers and rock climbers audible a quarter of a mile away. Directly behind our tent lay the gem of Linville Gorge. A small narrow path delicately weaved past rhododendron, mountain laurel, and isolated pine shrubs growing in shallow crevices. The path gradually widened, revealing an expansive view of the Blue Ridge Mountains blanketed in a sea of faint gold and auburn tinged trees nestled below a cloudless blue sky. In the days to come, many hikers would accidently arrive at our campsite after mistakenly assuming the path to our secret oasis led to Table Rock. 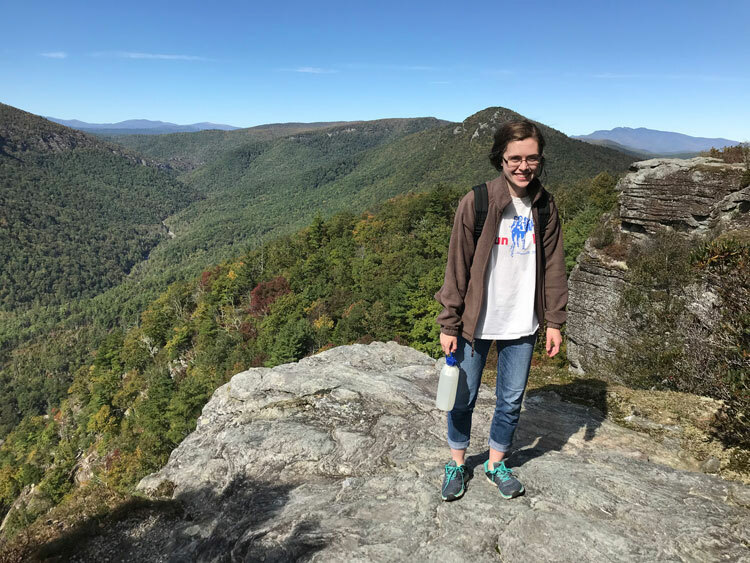 We became accustomed to the bewildered looks of hikers stumbling upon what appeared a dead end, but we easily persuaded them to gaze upon one of the finest views of Linville Gorge. No one left disappointed. Afternoon faded into dusk. Taking advantage of the remaining light, Dad cooked a hearty dinner on the stove: fresh sizzling catfish fillets served with steaming rice and corn. As food is nourishment for the body so was nature the food for the soul. With hungry appetites satisfied we steeled ourselves away to the cliff only mere steps from our tent and planted our folding chairs on the rocky terrain that was only feet from a precarious thousand-foot descent to the valley below. The sun slipped behind the peaks of the mountain range, casting golden beams of light across the sky and enveloping the surrounding landscape in a sleepy haze of shadow. As we sat in silence while the wind murmured around us there was no question that we were spectators of nature’s brilliant showcase, and we had the best seats in town. “This is what I remember” Dad said softly. Thirty years changes many things. We grow older, families grow up, our priorities and responsibilities change. Even the landscape of childhood retreats we once remembered eventually become subject to the effects of time. Places appear vaguely familiar as the blending of the past and present combine to form a new creation. In the midst of all of the change, it is remarkable that certain qualities remain untouched by the passage of time: sunsets, intimate conversation, father-daughter moments sprinkled with laughter and good-natured humor, whispers of hopes, dreams and fears spoken in hushed tones as one admired the serene natural beauty of one’s quiet abode. These were the treasured moments that would be recalled three decades later. The “do you remember when” queries would only be just the beginning of a lifetime of fond reminiscing. Reluctantly we returned to our tent which sparkled with mini LED lights strung across in a criss-crossed pattern across the interior. It truly felt magical, otherworldly in a sense. Isolated from the world we drifted off listening to the faint roar of the Linville River gliding along its course beneath a star-studded sky with the distant haunting echo of a lone train whistle punctuating the silence as it rumbled along to Tennessee through the NC mountains. The next morning was brisk, an icy remnant of the below freezing temperatures we experienced during the night. Fortunately, our insulated sleeping bags, combined with toasty hand warmers, warded off the chill, and we were no worse for the wear. After a warm breakfast of scrambled eggs and sizzling bacon we laced up our hiking boots and trudged up the trail to Table Rock, the Chimneys, and then crossed sharp rocky ledges seeking the elusive “amphitheater.” The name was given as a result of the land’s bowl-shaped terrain and was a frequent site of excursion by adventurous hikers. I suppose 30 years changes things a bit as we never discovered the site despite embarking on detours and meanderings from the main trail that led to nothing more than dense underbrush and precarious cliffs. Exhausted as we were, we remained in good spirits and settled down on a large slab of rock and hungrily munched on granola bars and gulped water from plastic water bottles stowed in our travel backpack. Looking across the distance, we spotted rock climbers only a short distance from us hauling equipment, gear, and colorful looped bundles of climbing rope. A thin slack line stretched between two boulders bobbed in the wind as a climber ever so slightly shifted his weight from the steady surface onto the swaying strip of nylon. Pure daredevils. Transfixed as we were of the spectacle we deemed it best to return to the trail, uneasily aware that any slight mishap could quickly result in grave injury or instant death. We eventually reached our campsite and took advantage of the remaining daylight to fix shrimp and grits on the stove. Any low country restaurant would have undoubtedly charged a premium for the pink jumbo shrimp swimming in a sea of creamy cheese gritty goodness simmering on the stove. Who said one had to sacrifice Southern cooking for rugged living? We had taken camping to a whole new level. Dusk slowly enveloped the mountains in a dim purple blue haze and we lazily drank in the cool night air and sipped hot chocolate made milky white by melted marshmallows. Anyone who has ever hiked a full day knows the feeling of a good kind of tired. The achy muscles are not immediately felt until the following day and only the feeling of pure bliss made palpable in the company of others remains. We sat in silence reflecting on our adventures, internally knowing but hesitant to admit that tomorrow would find us entering reality. Like everything in life, all good things must come to an end. If only we could linger here indefinitely, savoring every moment, breathing in the seductive magic of captivating rugged beauty. Our final morning arrived. After a pancake breakfast, we disassembled our tent, loaded up our backpacks, and hauled everything down the mountain to our car. On our last trip down the mountain we paused to deviate from the trail eager to discover a nearby spring that Dad and his friends frequented to retrieve fresh water years ago. 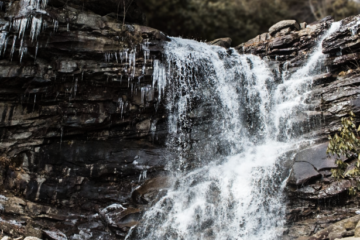 We were not disappointed as the gurgling water sprang forth from the earth, rippling across green moss and disappearing underneath smooth slick rock. We took a few photographs and then left, but not before pausing to photograph ourselves leaning against a massive boulder. The boulder was shrouded in a cloak of underbrush, lying in the shade of towering hardwoods. It stood there reserved, erect, and forlorn as if waiting for some lone hiker to rediscover it. In fact, three decades ago four young hikers perched upon it and gazed expectantly into the Canon camera that captured this moment that harkened to happy times that would forever be treasured both in memory and in heart. Now on this day, one of these hikers returned, but with someone new. Dad had brought his red flannel shirt, the same one he had worn in that original photograph. I put it on, posing near where he had once stood. We smiled into the camera, but we also smiled beyond that. We smiled at the memories we had made. We smiled at what had been, what was to be, and what was to become. We smiled at our hopes, fears, and dreams. We smiled at the place we had been closest to God.